They never had a party to celebrate their marriage, they didn’t have a single wedding photograph and they couldn’t afford a honeymoon, but 72 years later this adorable couple could be the most romantic pair in Britain. This Valentine’s Day, 100-year-old war veteran Moss Rich became Britain’s oldest working poet, deciding to publish the love poems written for his wife over their decades together. The pair first met in 1939 at a performance at London’s Unity Theatre. A true romantic, Moss wanted the first Valentine’s Day he spent with Milly to be special. In order to win her over he decided to write her a love poem and delivered it personally on February 14, 1939. And the reaction was more than he could have hoped for. Milly loved her poem so much that Moss decided to keep it up, writing her individual poems every anniversary, birthday and Valentine’s Day ever since. Now over 150 love poems later, Moss and Milly are enjoying married life 72 years on. His poems, handwritten or typed on his personal typewriter, are all signed and dated and addressed to his lifelong love and muse, 93-year-old Milly. Milly says: “When I received that first poem from Moss I knew it was special because it was from the heart and not from over the counter. Like so many couples at the outbreak of war, the young couple, then 19 and 26, decided to tie the knot as soon as possible, leaving them no time to organize a lavish ceremony or even afford the luxury of a photographer on their special day, October 9, 1939. Pressured to support his new family, Moss even returned to work that same afternoon at a timber merchant’s, while his bride went shopping for a kettle, a saucepan and two cups and saucers for their new kitchen. Milly, a former fashion designer, teacher and businesswoman, says: “We got married very quickly because when war broke out everyone thought the whole of London would go up in smoke. We’d known each other a few years but we never intended to get married so soon because we had no money. Their relationship was tested when Moss was inevitably called to service shortly after the outbreak of war. Three months after joining, Moss’s bad eyesight meant he was unable to serve any longer under the King’s Regulations, and he was discharged with a morning’s notice. Despite the rushed start, their marriage has been long lasting and full of romance. 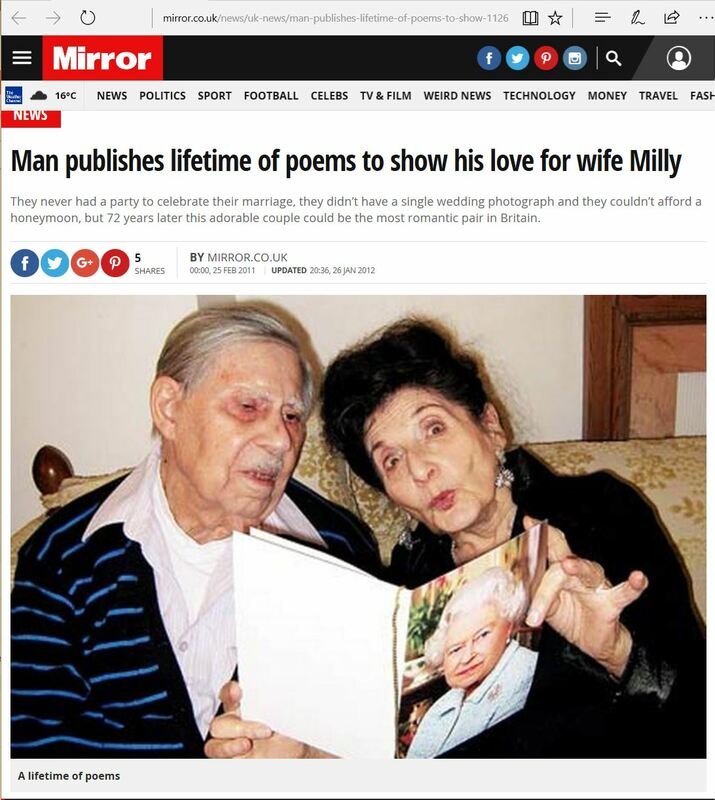 Milly says: “I look forward to every day I spend with my wonderful husband, butbirthdays and anniversaries are made extra special by his poems. “He’s never failed to produce a new one on every special occasion we’ve spent together, it’s wonderful.” His poems are not titled or headed, just simply preceded with the words “For Milly”. In his 2003 anniversary poem Moss writes simply: “May all the years to come remind us, of the years we left behind us. So are these poems the secret to their long and happy marriage? “So many people have asked the secret, but I’m being completely honest when I say there isn’t a secret,” Milly admits. “Moss is always thoughtful and considerate and I believe our marriage has lasted so well because we appreciate each other. “I don’t think marriage is something you work at, I think you lie back and enjoy letting it flow over you. When you have a happy marriage the time just passes. But she did joke there might be another reason for their long marriage. “I think he may suffer from marital deafness,” she says. The couple have lived in Sussex for more than 40 years, in Hove near Brighton, and were married with a special licence at a synagogue in London. They have one daughter, Shula. Milly treasures her ever-growing collection of poetry, keeping each new addition safe in a box in their bedroom. She says: “I often get asked if I have a favourite, but how can I choose when they are all so special in their own way? Now deaf and blind and entering his ninth decade of writing, Moss hasn’t been deterred by his disability, still managing to create his poems by composing them in his mind and reciting them to his wife, who records them to be played over again. So does Moss think he’s super romantic? To celebrate their long and happy marriage, Moss and Milly decided to publish the collection on the most romantic day of the year, Valentine’s Day. Printed on illustrated postcards and titled ‘A Lifetime of Love’, the cards have been designed to allow others to share Moss’s words with their loved ones. Milly says: “Moss’s poems are full of love and warmth. They’re very affectionate and I don’t think you can ever have too much of that. Despite his way with words, Moss admits he is usually quite shy when it comes to talking about love.